Under Construction Machine – this is one of my flash animations re-designed to HTML5 with help of CreateJS. Hand-drawn animated fantastic mechanism from letters “under construction” with customizable logo integrated on screen, jQuery countdown timer, 2 skins (light and blueprint). Cartoon retro-styled mechanism animation centered in browser window. 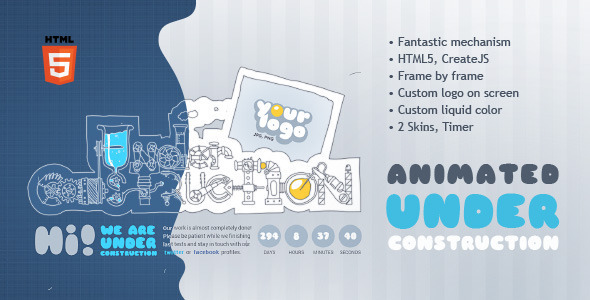 Your logo is clickable with custom URL. - Customizable liquid color, logo. - 2 Skins (light and blueprint). - Fallback dummy page with static picture for IE8 and earlier versions. Due to CreateJS requires the HTML5 Canvas, which is not available for IE8 and earlier browsers, in this theme I add dummy fallback page with non-animated .jpg machine picture and alert message. In Opera browser this animation have some strange tiny glitches (thin horizontal lines occuring above animation), I still could not figure out why. The rest browsers is ok.